Combining Bible and handwriting practice is a great way to teach your children about God's word, while also working on their handwriting skills. It gives them a chance to practice good pencil grasp, letter formations, and neatness, while hiding God's word in their hearts. Today I am sharing 10 great ideas for combining Bible with handwriting practice. 1. I can Trust God Coloring & Handwriting Sheets – Your children will learn they can trust God with this FREE printable packet that I offer here on my blog! It is designed for Prek-2nd grade and includes coloring sheets, handwriting copy and tracing sheets. It is also designed to go with the Hermie & Friends I will Trust God DVD. This site offers numerous free printable packets for your children to learn about the Bible and practice their handwriting. Some of the topics include Bible verses, David & Goliath, The Days of Creation, The Lord's Prayer and much more. This free printable set includes flashcards and writing pages to help your children memorize the books of the Bible! This free printable packet includes 26 Bible verses, one for each letter of the Alphabet. She also includes a free resource for how you can turn these verses into some copywork sheets! Kelli offers many printables for multiple verses of the Bible that include copywork sheets of each verse, to help with memorization and handwriting practice. Trisha and Luke offer an amazing Write Through the Bible curriculum on their website! It includes The 10 Commandments, Philippians 2:1-18, Psalm 1, 23, and 121, and The Lord's Prayer. You can read more about their entire curriculum HERE. 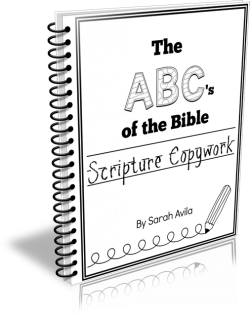 Sarah provides a Bible Scripture Copywork ebook on her site that gives you 26 Bible verses to go along with each letter of the alphabet. You can see a free sample on her site as well! Dollie shares how her family uses Grapevine Studies for drawing and learning in the Bible. Drawing is a great fine motor activity to practice proper pencil grasp, visual motor skills and more! This lesson is part of the Phonics By the Book series that Becky has put together. This particular packet is based on Genesis 1. It includes sight words, writing prompts, Bible verses and more! It is free for you to download! This is a set of free printable scripture cards that follow the ABC's. You can print out the cards and laminate them. Then you can use Handwriting Worksheets to type in the scripture verses and print out the writing pages to go along with the cards! Both the scripture cards from I Can Teach My Child and Handwriting Worksheets are free.